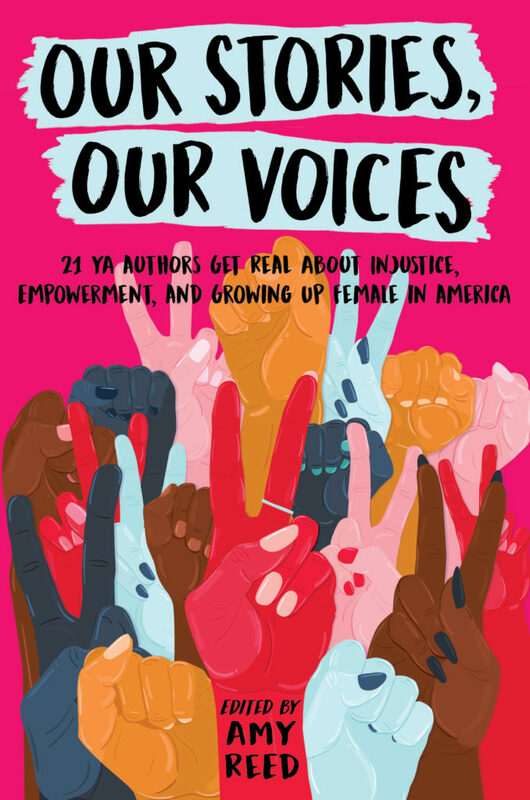 I am so incredibly excited to announce that my anthology, OUR STORIES, OUR VOICES: 21 YA AUTHORS GET REAL ABOUT INJUSTICE, EMPOWERMENT, AND GROWING UP FEMALE IN AMERICA is officially out in the world today, and available from online booksellers including Malaprop’s (my local indie), Books-a-Million, Indiebound, Barnes & Noble, Amazon, and Simon & Schuster. You should also be able to find it at your local bookstores and libraries, and you can always request that they order it if they don’t have a copy. First, I want to thank the incredible authors who shared their wisdom, vulnerability, and courage in their contributions to this book: Martha Brockenbrough, Jaye Robin Brown, Sona Charaipotra, Brandy Colbert, Somaiya Daud, Christine Day, Alexandra Duncan, I.W. Gregorio, Maurene Goo, Ellen Hopkins, Stephanie Kuehnert, Nina LaCour, Anna-Marie McLemore, Sandhya Menon, Hannah Moskowitz, Julie Murphy, Aisha Saeed, Jenny Torres Sanchez, Amber Smith, and Tracy Walker. They are incredible writers and incredible women, and I am honored to call them my friends. Read all their books. Seriously. I kept trying to think about what I would say here about the book on release day, and I realize I said it best in the book’s Introduction, so, with my publisher’s permission, I am including it below. Thank you for caring about my work and the work of the authors in this anthology. Thank you for caring about our stories. I hope you read them and and are inspired to tell your own. Because in these times when so many of us are feeling silenced, our voices and our stories are our greatest resistance. [Read more…] about OUR STORIES, OUR VOICES is out TODAY!